This product line became available in 2007 with software release 4.0 and the device was demonstrated in March at the 'Spring VoiceCon 2007'. In March 2007 the product started to ship, and then in May 2007 a detailed evaluation between this switch and two competitor's switches identified that this switch had a better performance and better total cost of ownership. In 2008 Layer 3 routing support, secure web access with https and TACACS+ were added to the software in version 4.2,. In January 2008 another detailed evaluation of this systems was performed by Tolly Enterprises, LLC. comparing the 2500 systems to Catalyst 2960-24T and HP ProCurve 2626 and 2650 systems. In May 2009 Cisco published an evaluation and comparison between this switch and its 2000 and 3000 series switches as competitor published fear, uncertainty and doubt about the product not having the ability to do routing, even after the product had released the new routing software almost a year earlier. Later in November 2010 IGMP multicast and IPv6 management was added in version 4.3. As of February 2012 the software version 4.4 is the latest software released for the product which was currently published in Aug 2011. The ERS 3500 Series consists or four gigabit Ethernet models the 3510GT, 3510GT-PWR+, 3524GT, and 3524GT-PWR+ along with 2 fast Ethernet models 35265T, and 3526T-PWR+. The Switch leverages 802.1AB link layer discovery protocol and LLDP media endpoint discover and auto discovery and auto configuration to allow the Switch to automatically configure or reconfigure itself for new phone installs or phone movement in 1 minute. The switch can be installed initially as standalone and then field-upgraded via a license to support resilient 'Stackable Chassis' configuration of up to eight Switches. The stack-enabled version of the ERS 2500 Switches will not require a license kit or license file. The ERS 2550T supports 48 ports of 10/100 plus two Gigabit uplink ports that are a combo configuration of 1000BASE-T/SFP. The ERS 2550T-PWR supports PoE capabilities on half of the user ports. System scaling is accomplished by stacking eight ERS 2550T-PWR systems together to provide up to 384 ports of copper 10/100BASE-T and with the ERS 2550T-PWR models, 192 of the ports will support Power-over-Ethernet (all the ports with the red border around them will support PoE - see the adjacent picture) and up to 16 ports of 1000BASE-X Small form-factor pluggable transceivers. The ERS 2526T and ERS 2526T-PWR models offer 24 ports of 10/100 plus two Gigabit uplink ports that are a combo configuration of 1000BASE-T/SFP. The ERS 2526T-PWR model offers PoE support on half of the user ports. When staking eight ERS 2526T models it will provide 192 ports of copper 10/100BASE-T, and with the ERS 2526T-PWR models 96 of the ports will support PoE and up to 16 ports of 1000BASE-X Small form-factor pluggable transceivers. The system also has the ability to stack any combination of these Switches (up to 8 switches) in a system. The ERS 2500 Series of Switches can be stacked with Flexible Advanced Stacking Technology (FAST) to allows eight switches to operate as single logical system with a 32 Gbit/s virtual backplane. The stack operates on a bi-directional and shortest path forwarding star topology that allows traffic to flow either 'upstream' or downstream' simultaneously from every switch allowing packets to take the optimal forwarding path (shortest path). The bi-directional paths allow the traffic to automatically redirect around any switch in the stack that is not operating properly. This stacking technology allows stackable switches to operate with the same performance and resiliency as chassis solution. The entire stack can be managed from the base switch by several methods: Console into the base switch and use command line or a menu; telnet/SSH into the IP address of the base switch IP address and use command line; SNMP into the IP Address of the base switch to use the GUI configuration tools to management all switches on the stack at once. This switch allows for link aggregation from ports on different stacked switches either to other switches not in the stack (for example a core network) or to allow servers and other devices to have multiple connections to the stack for improved redundancy and throughput. ↑ "Avaya Ethernet Routing Switch 2500 Series" (PDF). Avaya. Retrieved 22 Sep 2010. ↑ "Lifetime Warranty for Ethernet Stackable Switches" (PDF). Avaya. Retrieved 10 June 2010. ↑ "ERS 2500 Series Quick Install Guide". Retrieved 18 Feb 2012. ↑ "Software Release 4.1.0 and 4.1.1". Avaya. 11 Dec 2007. Retrieved 18 Feb 2012. ↑ Howard Solomon (24 May 2007). "Nortel outlines new strategy for unified data communications". IT World Canada. Archived from the original on March 2011. Retrieved 18 Feb 2012. ↑ Tolly Group Engineers (May 2007). "Ethernet Routing Switch 2526T & 2550T Competitive Performance Evaluation vs Cisco Catalyst 2960-24T & 48T, and ProCurve Networking 2626 & 2650 - Report # 207178" (PDF). Tolly Enterprises, LLC. Archived from the original (PDF) on March 2011. ↑ "Nortel Ethernet Routing Switch 2500 Series Release Notes — Software Release 4.2". 2008. Retrieved 20 Feb 2012. ↑ Tolly Group Engineers (January 2008). "Performance, Resiliency and TCO Comparison to Cisco/HP ProCurve Across Network Classes Report # 208275" (PDF). Tolly Enterprises, LLC. Archived from the original (PDF) on July 2011. Retrieved 6 Jan 2012. ↑ Tolly Group Engineers (January 2008). "Performance, Resiliency and TCO Comparison to Cisco/HP ProCurve Across Network Classes Report # 208275" (PDF) (in German). Tolly Enterprises, LLC. Retrieved 6 Jan 2012. ↑ "Reason to Call play Guide for Cisco Partners" (PDF). Cisco. May 2009. p. 20. Archived from the original (PDF) on March 2012. ↑ MICHAEL MCNAMARA (October 31, 2009). "Nortel IP Telephony Deployment Technical Configuration Guide: Ethernet Switch platforms that support PoE". Retrieved 28 Feb 2012. ↑ "ERS 2500 series". AGC Networks Ltd. Retrieved 25 Feb 2012. ↑ Phil Hochmuth (23 June 2003). "Nortel tries to stack up; High-speed stackable switches on tap". Network World. Retrieved 31 Dec 2011. ↑ Larry Hooper (2003). "Nortel Brings Intelligence To The Edge With Two New Switch Lines". CRN UBM plc. Retrieved 2 March 2012. The Switches also feature Nortel's new Flexible Advanced Stacking Technology, or "FAST Stack," design, which automatically redirects all traffic around any box within a stack that is not performing properly. ↑ "Avaya Stackable Chassis" (PDF). Avaya. Retrieved 3 March 2012. Tanya Palta (20 April 2012). 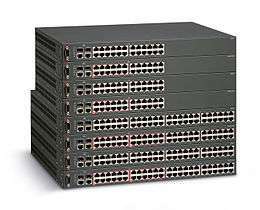 "Avaya Releases Ethernet Routing Switch (ERS) 3500". TMC Net. Retrieved 4 May 2012. Paul Robinson (25 April 2012). "New Ethernet Switches from Avaya Simplify Operations for Small and Midsize Enterprises and Remote Branches". Unified Communications Stratiges. Retrieved 4 May 2012. Heather Clancy (23 April 2012). "Avaya targets small businesses with new network gear". ZDNet. Retrieved 4 May 2012. Jeffrey Burt (18 April 2012). "Avaya Unveils Network Switches for Small Enterprises". E Week. Retrieved 4 May 2012. Nortel Ethernet Routing Switch Solutions (First ed.). Research Triangle Park, NC: Nortel Press. October 2008. pp. 19–20, 63, 219, 221–223, 296, 385–387, 399–400, 467, 471–472. ISBN 978-0-9815218-1-7. "Avaya 2550T-PWR Ethernet Routing Switch". Communications Products Inc. Retrieved 18 Feb 2012. "ERS 5000/4500/2500 Advanced Configuration and Maintenance". Global Knowledge Training LLC. Retrieved 18 Feb 2012. "Worcester Polytechnic Institute Network 2008" (PDF). Worcester Polytechnic Institute. 2008. Archived from the original (PDF) on March 2011. "Nortel Ethernet Routing Switch 2500 y 4500" (in Spanish). Network World. 2007. Archived from the original on March 2011. Wikimedia Commons has media related to Avaya.